BBC Worldwide have issued a press release for the launch of new Doctor Who games on the Nintendo Wii and DS platforms. The world's longest running science fiction TV series Doctor Who will be brought to life on Nintendo DS™ and Wii™ this winter by game developer Asylum Entertainment and global distributor Koch Media Ltd. 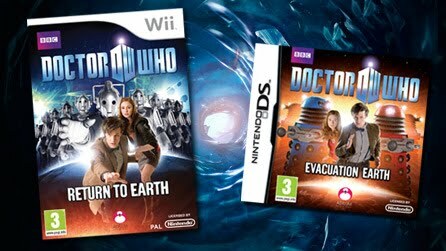 Licensed by BBC Worldwide and based on the top-rated television series starring the Eleventh Doctor, Matt Smith, and his Companion Amy Pond played by Karen Gillan - Doctor Who: Evacuation Earth for Nintendo DS and Doctor Who: Return to Earth for Wii will hit retailers in the UK, Australia and selected territories across Europe. Inspired by the Doctor's adventures across time and space, Doctor Who: Evacuation Earth and Doctor Who: Return to Earth have been carefully developed to capture the imagination of Doctor Who fans and will enable the entire family to become the Doctor and Companion Amy in stories written with the Doctor Who production team. Simon Bailey, Managing Director of Asylum Entertainment comments: "We are incredibly excited to be collaborating with BBC Worldwide on these two new games. It is our firm belief that the franchise has massive potential on the Nintendo DS and Wii formats and it’s an honour to be bringing Doctor Who video games to the show's huge fan base."